Question: I am very interested in this plan. Are the ceilings vaulted in the family/living room and master suite? I have another one of your plans that I like better for the guest's bedrooms and bathroom. Is there any way to combine the 2 plans? Answer: The ceiling is vaulted in the Great Room and we call for 8 inch cross beams (non-structural) The Master Suite has cross beams too on a 10 foot flat ceiling. We’re happy to entertain merging two of our designs. You can discuss options and receive a quote from our modifications department by calling 800-482-0464 ex. 410. Question: Is there a plan with an upstairs bonus room or is there space for one with this one? Where would the stairs go? 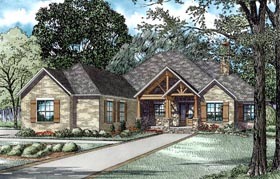 Answer: Thanks for your inquiry – this plan is amazing….We don’t currently have a bonus over garage but can create through modifications; must raise the roof ridge on garage to allow for head room and the stairs must be placed to where the top of stairs will be centered in the bonus room. To get a quote for modifying the plans, please call 800-482-0464 ex. 410. Question: Great plan. In the basement plan where would the stairs go? ?